Super impressed by the speedy response of one of my favorite brands, that quite unfortunately, failed me at retail last week. I couldn’t wait for you to open in Rockefeller Center and now I regret my decision. 1 – I had a partially filled gift card and without fail, every single time I visited (4x) there was a problem with it. Eventually it worked but not before I felt like I was a hassle to the team. Once I was asked to pay with another form of payment, even though there was more than enough on the card. 2 – Which prompted me to write today — I paid for my purchase (half with the remaining balance on my gift card and half in cash) — of course it took forever to pay so my drink was ready before I even stepped away from the register. I was handed the drink, handed my money. Sure enough a few seconds after I walked away from the counter, my drink started to leak, and leak. The cap popped off and I was the woman holding the leaky Orange Dream Machine in the elevator. I wasn’t given any napkins, of course, so it was my receipt that I was trying to use as a makeshift napkin until I could get up to my office. Of course in the meantime the drink was spilling – down my dress (which I had JUST picked up from the dry cleaners) and down my leg. My hands were sticky and of course I had to reach into my pocketbook for my work ID so who knows what has orange stickiness on it now. Since Orange Dream Machine is part milk product, and I hate the smell of sour milk, I now feel gross and sticky. And my day has just started. So much for Jamba brightening my day. It has, no pun intended, completely soured it. Perhaps I will stick with the Dunkin Donuts just next door. @JambaJuice soured my morning. My drink was over filled, lid popped off and #Orange Dream Machine dripped down my leg and stained my dress. I received this response to my email on Wednesday, August 24 @ 1.29 PM [less than four hours later, and I think it only took that long because they are on the West Coast]. There was no Twitter response then, or now, a week later. Thank you so much for taking the time to share your thoughts with us. Although we are sorry to read about your experience, we find your feedback very helpful in that you point out specifics and give us direction as to where we need to improve. On behalf of all of us here at Jamba Juice, please accept our sincerest apologies for the poor service and product we provided you at our Rockefeller Center location. From what you have described, we have some additional training and coaching to perform right away. We have shared your feedback with our field management team for review and follow up with the members of our team at this location. We pride ourselves on offering our customers a positive, uplifting experience. We greatly appreciate you allowing us the opportunity to address your concerns and to make things right. If you would please provide us with your mailing address, I would be happy to mail you a couple complimentary 16 oz. 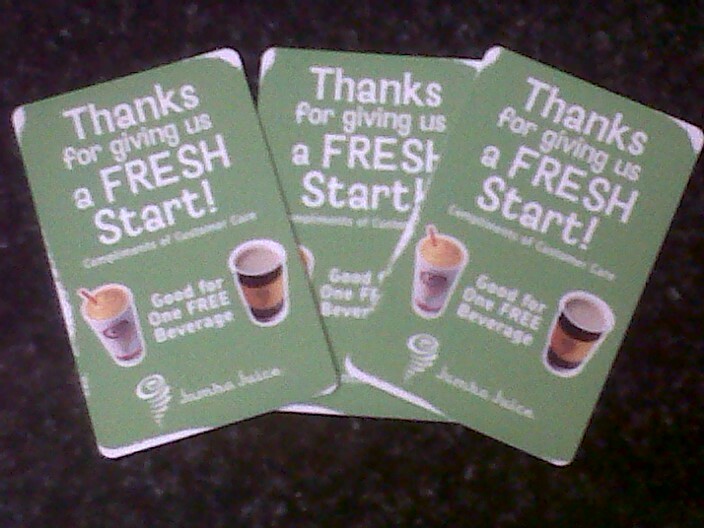 beverage cards for you to use on your next visit. More importantly, we will address these service issues right away. Thanks for your prompt response. Because of the busy, and therefore, ideal, location, additional training is a must. I have worked in many consumer-facing jobs, and I believe good customer service and a good product are of utmost importance. I’m glad you think so too. Thank you for the gift cards. My address is X.
I received three gift cards in the mail exactly one week later. Way to go Jamba Juice. It’s not about getting free stuff. It’s about a solid and immediate response. The real test is my next trip to Jamba. I’d like to avoid being that girl in the elevator (again) with the dripping drink, thanks very much. This entry was posted on Thursday, September 1st, 2011 at 6:00 pm	and posted in letters, responses. You can follow any responses to this entry through the RSS 2.0 feed. « WHY call it a starter?